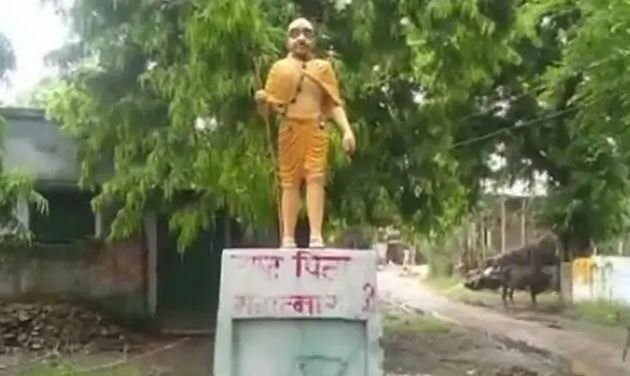 SHAHJAHANPUR, UTTAR PRADESH: The Congress party on Friday alleged that members belonging to the ruling BJP have painted in saffron colour a statue of Mahatma Gandhi installed outside a government school in Dhaka Ghanshyampur village in Shahjahanpur and sought action against them. But the district administration downplayed the whole issue, saying an enquiry showed that the colour on the statue was not saffron in fact yellow one and it had been painted two years ago on the direction of the school administration. A delegation led by district unit president of Congress party Kaushal Misra met the district magistrate Amrit Tripathi there on Friday and handed over a special memorandum demanding immediate action against the miscreants who painted the statue. Taking very serious note of the matter, the district magistrate ordered for an immediate probe, to be led by Sub-divisional Magistrate Puvaya Satyapriya Singh. “I sent the party’s block unit president Rahul Sharma to the primary school where the statue was installed. He found the statue painted in saffron. He even clicked photographs,” Mr Misra said. The Congress party members located in Lucknow and Delhi have been apprised of the matter. Mr Misra said ruling party members are behind the such an incident as they are using it to divert public attention from pressing issues. The DM said a team of officials were sent to the spot where they found the painting work done over two years ago. While responding to the administration’s claim that the painting was done about two years ago, the Congress party leaders said if that was the case, actually, then the matter would have come to light earlier itself and not yesterday. But there have been many such incident in which statues were painted in saffron color. 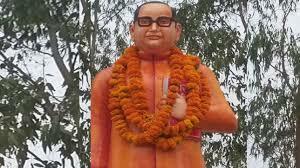 In a similar incident, a statue of Baba Saheb Ambedkar was painted in saffron color by fanatics in Badaun village of Uttar Pradesh district in the month of April this year. Such incidents of fanaticism must be curbed by rightful people present in the society. Otherwise the situation might worsen day in and day out.